We worship as usual this weekend: Our convenient community Holy Eucharist service at 5 p.m. on Saturday (April 1) and on the Fifth Sunday in Lent at 8 and 10 a.m. We’ll hear about Jesus Christ’s raising of his friend Lazarus, one of the gospel’s most powerful and mysterious stories, and one that embodies (quite literally) God’s never-ending compassion for our suffering world. This and our other readings will lead us to our fifth and final frontier when it comes to discerning the way forward in a time of change. We’ve already talked about personal, family, community, and workplace discernment. 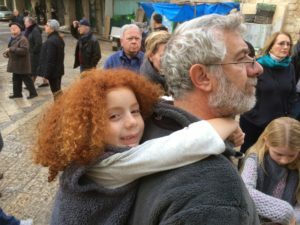 On Sunday morning, our subject will be nothing less than healing the world while discovering ways, rooted in traditional Christian ethics, to be less anxious about national and global affairs (whatever our views and those of our loved ones and friends). It’s easy to support ERD on-line. This Sunday, we’ll also take a collection using special containers in the narthex. Please make your checks out to St. John’s Church with “ERD” in the memo line. You can also donate cash. Using my discretionary account, I’ll supplement your generous gifts. If you have any questions about ERD, don’t hesitate to contact DJ Gomer at djgomer@cox.net or me. If you want to learn more about our own parish’s community outreach ministries, reach out to coordinator Roger Bradshaw at parisbradshaws@me.com. Speaking of complex issues, if you’re interested in learning more about the local angle on immigration, join the Rt. Rev. Diane Jardine Bruce and me this Saturday (April 1) for a Lenten via crucis (“way of the Cross”) trek from Echo Park to Friendship Park at the Mexico-U.S. border, including lunch for pilgrims when we stop at about 12:30 p.m. in Lemon Grove in the Diocese of San Diego. 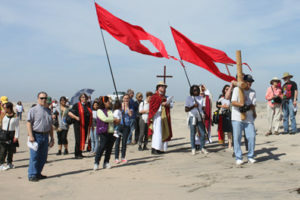 The journey features walking the Stations of the Cross at parish churches along the way, culminating with a beach walk to the border fence, where the Rt. Rev. James Mathes of San Diego, Bishop Bruce, and I will preside at Holy Eucharist. All are invited to take part. Transport will be by private cars traveling in caravan. The pilgrimage departs from the Cathedral Center of St. Paul in Echo Park at 7:30 a.m. on Saturday. Bishop Bruce and I will join the caravan at about 9 a.m. at St. Michael’s Episcopal Church, 311 W. South St. in Anaheim, where parking will be available for those not electing to be drivers. Participants should expect to head north from San Diego at about 4:30 p.m. For more information, please reach out to the Rev. Norma Guerra at associate@messiah-santaana.org. All are also called to the second installment of “Mining For St. John’s Gold” at 9 a.m. on Sunday (April 2) in the Bishop’s Room. Last Sunday, St. John’s members shared deeply moving stories about their personal faith journeys and epiphanies. This week, it’s all about St. John’s: Why you came, why you stayed, when you’ve felt most and least connected, and what your worries and hopes are for the future. Please join Pam Kelley and me as we facilitate the conversation. Finally, some seasonal reminders (look for the sign-up sheet in the narthex for the Maundy Thursday all-night prayer vigil, beginning after services on Thursday evening, April 13 and ending at noon on Good Friday; and we need your Easter flower thanksgivings and memorials by Palm Sunday, April 9) and some outreach reminders (our first-Tuesday food pantry on April 4, where we need your food gifts and volunteer presence and for which Roger Bradshaw will answer all your questions), and Laundry Love Lake Forest on Wednesday, April 5, for which Randy Simmons at rhs8453@yahoo.com has all the answers).